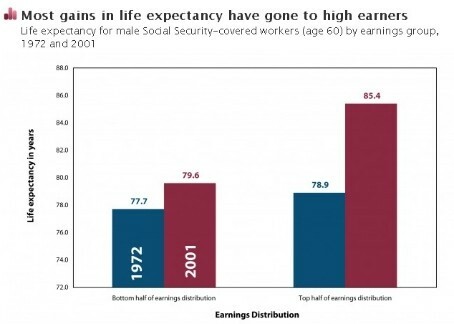 For 2008, the employee's share of the Social Security portion of the tax is 6.2% of gross compensation up to a limit of $102,000 of compensation (resulting in a maximum of $6,324.00 in tax). For 2009 and 2010, the employee's share is 6.2% of gross compensation up to a limit of $106,800 of compensation (resulting in a maximum Social Security tax of $6,621.60). The justification for setting up the taxes this way is that wealthy people would complain and try to get rid of progressive programs like Medicare and Social Security if big chunks of their money were being taxed in order to finance other people's retirement. So basically if we flattened the payroll tax, we'd have the problems we have now, but we'd also have a progressive tax rate structure. Ezra is arguing against raising the retirement age, making the powerful point that "raising the retirement age inflicts a double-blow on lower-income Americans: They already work more physically demanding jobs and die younger than the rich, but now they’re being told to work those jobs longer because people who aren’t them have seen large increases in life expectancy." The way this point for flattening the payroll tax is that wealthy people are getting more out of the system by living longer. There's no need to fund the system with a regressive tax on top of that. I'm guessing that the current system still ends up being fairly progressive. The point is just that it isn't nearly as progressive as proper consideration of money's diminishing marginal utility ought to make it. In the small city within the metropolitan area of Louisville we have 1% Louisville Metro occupational taxes and 1% small city occupational tax. The small city wants to add .75% more to finance a police force, which is already provided by the Louisville Metro LMPD. This has nothing to do with SS/Medicare but is an unnecessary tax. I've always felt SS/Medicare should be taken from all occupatoinal income without limit.